Laboratory Exercise: What Controls Rheology? 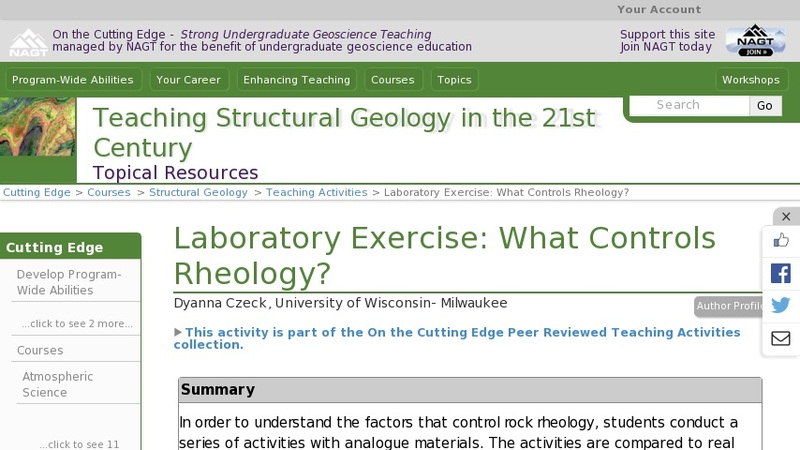 A short laboratory exercise, conducted by students, is used to illustrate the multiple factors that contribute to rocks' varied responses to deformation. Analogue materials (play-doh, notebook springs, butter, silly putty, plastic bags, etc.) are used to illustrate many of the controlling factors such as lithology, stress, temperature, confining pressure, strain rate, preexisting weaknesses, and accumulated strain. The analogue experiments are presented in conjunction with parallel data from deformation experiments and field studies. The tandem presentation of analogue experiment and real data requires the students to obtain a natural "feel" for rheologic parameters and more exhaustively analyze the important conclusions obtained from field and deformation experiment data.